Ask Me Bout My Turtle | Be the One. Ask me about how we were in The Columbus Dispatch. Ask me about how we got to sing Carmen Ohio with the Ohio State Buckeyes. Ask me about that 32-pound bundle of joy above Zeke’s head (a.k.a. IllyIllibuck, the 2nd oldest trophy in the Big Ten Conference). Ask me about how I joined an organization full of incredible student leaders, and how it transformed into a family. So go ahead: ask me about Bucket and Dipper Junior Class Honorary. Last fall, I wanted to get more involved at the university level. I took a risk and applied for Bucket and Dipper Junior Class Honorary. No one knew my name nor did I know theirs. Together a group of thirty strangers embarked on a yearlong journey of scholarship, service, and leadership. For those most involved (including myself) were chosen to go on the University of Illinois’s football field for the beloved tradition of the Illibuck Pass. 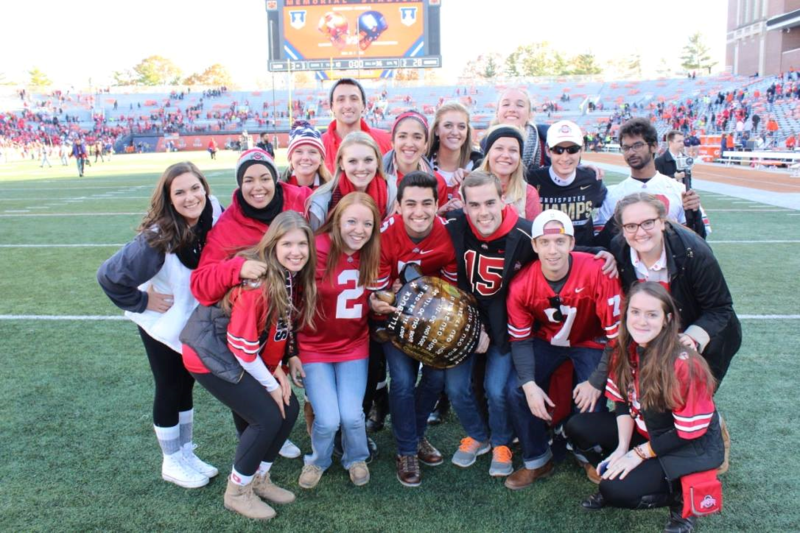 Seven members of both Bucket and Dipper and our sister fraternity from University of Illinois, Atius-Sachem, strolled out onto the football field during the fourth quarter of the Illini/Buckeye game. Joy gleamed on each of our faces as 60,000 fans cheered us on. I stood at the end of the pass waiting for the trophy to come back to OSU’s possession. Finally, I received Illy and I could not contain my excitement any long. Jumping up and down, waving Illy around, and yelling for all to hear as I ended the Illibuck Pass. If that wasn’t extraordinary enough, we received a surprise from our advisor and Ohio State. Bucket and Dipper would be returning to the field again to sing Carmen Ohio with the football team. The game ended and the speckle of red at the corner of the stadium shouted at the approval of another Buckeye win. Somehow I landed among the offensive lineman. Television does not do these men justice. They were twice the width of me with another foot and a half in height. But together, we swayed back and forth on the field for the cherished tradition of Carmen. Posted by glass229 at 9:00pm March 1, 2016 Posted in Student Life. Bookmark the permalink.